Not all of us are fortunate enough to have a place that we can call home and return to during this festive holiday season. 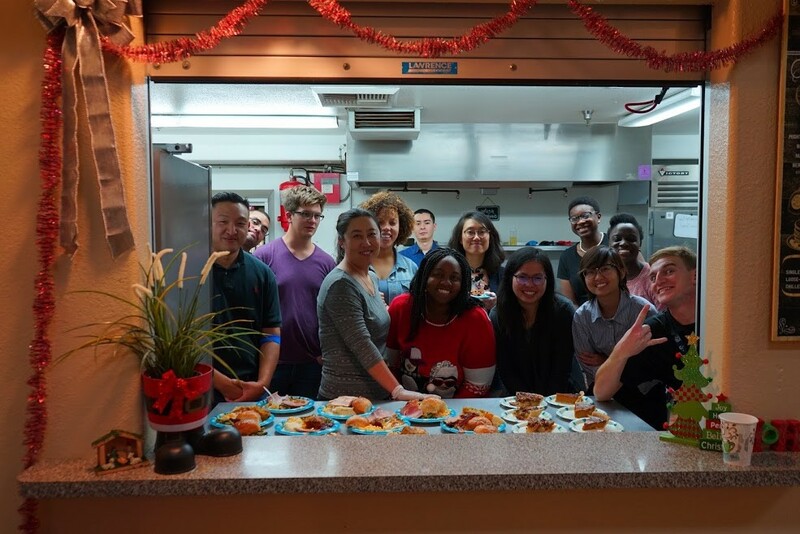 To bring a little warmth to those that are less fortunate than we are, volunteers from ASCE OC and YMF teamed up on Friday, December 14th, to host a holiday-themed meal service. The service took place in Midway City at the Illumination Foundation Recuperative Care Center. The Recuperative Care Center provides homeless individuals with a place to stay so that they can fully recover after being released from the ER or hospitals. The meal service consisted of many holiday favorites such as turkey, ham, mashed potatoes, and pecan pies. Volunteers collaborated with one another to deliver plates of entrées and desserts. After dinner, everyone including the volunteers played Bingo together. Prizes for the Bingo games included gift cards, blankets, and candies. Jackets donated by Zaki Mustafa and his wife, Loretta Mustafa, were handed out to everyone by volunteers after the Bingo game. As the night concluded and the holiday season continues to pass, the memories of shared smiles and laughter will always remain. The appreciation shown by everyone that attended this event motivates us to continue helping those in need and make the world a better place little by little. Come join us at our next community service event. To learn more about the Illumination Foundation, please visit: [IF].